music, film and tv both in the US and abroad, especially Japan. A deep dive into what makes hard rock/metal fans tick. Featuring some of the top names in Rock including Metallica, Korn, Five Finger Death Punch, Rob Zombie, Slipknot, Avenged Sevenfold, and many more. Cosplay Universe explores the rise of the global Comic Con sub-culture and evolution of Cosplay; the art form of becoming a character that you love. The film follows the journey of several international cosplay teams as they compete in what is known as the 'Olympics of Cosplay' at the World Cosplay Summit in Nagoya, Japan. Cosplay Universe also chronicles America's top cosplayers' challenges to turn their geeky hobby into a thriving business. The film taps into the psychology behind this art of self expression and demonstrates how Cosplayers can transform and expand their perceptions of themselves while finding community. Cosplay Universe features appearances by comic book legend Stan Lee, cosplay superstars Yaya Han and Jessica Nigri and many more. 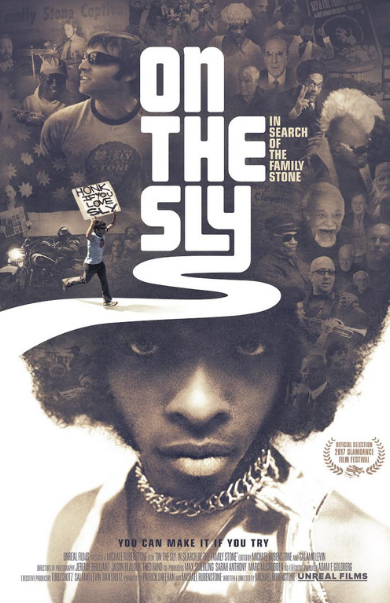 Michael Rubenstone, a first-time filmmaker, and Sly and the Family Stone super fan, sets out to find the band’s leader, the reclusive funk legend – Sly Stone. In doing so, he manages to make the most comprehensive documentary on the band to date, while also bringing Sly out of hiding for the first time since his Rock and Roll Hall of Fame induction in 1993. Part road movie, part rock doc, On the Sly follows Michael over the course of ten years, across the United States, as he unearths the true story of the band and chronicles how a musical icon fell from grace. Along the way he meets members of the original Family Stone, some eclectic characters who soothe his soul, and some who make him question his search entirely. Through detailed interviews we learn about the complexity of Sly Stone, all while grappling with the question, “Why do we search for our heroes?” Is it to find answers from them, or ultimately to find answers within ourselves? Hit the road and join.